Sodium Hydroxide (NaOH) solution or aqueous Ammonia solution can be added to the solutions containing metal ions in order to discern their identity. The colour precipitate from by the reaction can be used to determine the metal identity. In some cases, the precipitate dissolves in excess NaOH and Ammonia. 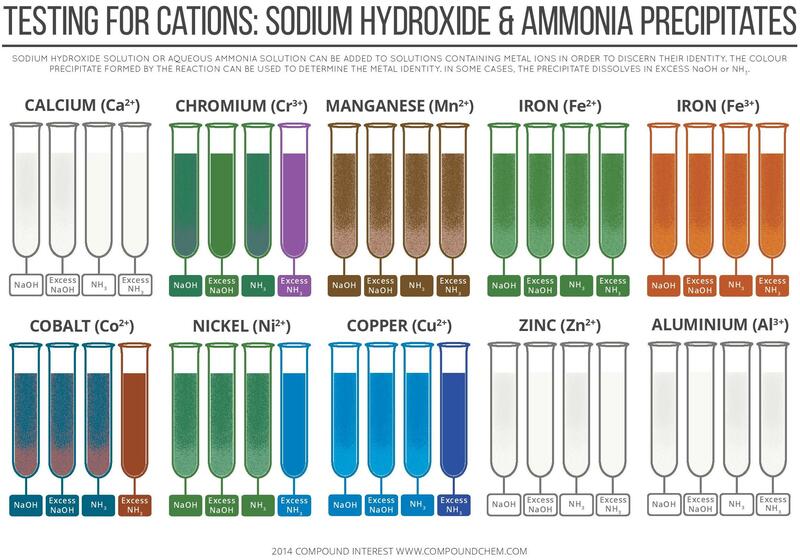 In the following Test for Cations by Sodium Hydroxide & Ammonia Precipitates infographic colours of precipitates of the following metal ions shown. This infographic would really help to the Cambridge International Examination A Level Chemistry Students for the preparation of Chemistry Paper 3. You can read full article on Testing for Cations By Sodium Hydroxide & Ammonia Precipitates and download pdf of this infographic on compound interest.